MISSION, KS--(Marketwired - Jul 12, 2016) - (Family Features) Grapes make the perfect snack: they are delicious, with a juicy burst of flavor, and are hydrating, easy to eat and portable. Additionally, grapes are good for you, offering a variety of nutritional benefits. Grapes are a natural source of beneficial plant compounds, including antioxidants and other polyphenols. At just 90 calories per serving, they also contain no fat, no cholesterol and virtually no sodium. This healthy, handy fruit is also a versatile ingredient, making grapes a perfect way to enhance your favorite foods and recipes. With their delicately sweet flavor and vibrant hues of red, green and black, grapes lend a delicious and attractive addition to dishes from breakfast to dinner. The recipes that follow highlight the art of the possible with fresh grapes from California. Find more recipes for every meal of the day at grapesfromcalifornia.com. Heat grill to high and oil grates. Sprinkle salmon with salt and pepper; set aside. In small saucepan, combine rice vinegar, ginger, honey and olive oil, and bring to simmer over high heat. Stir in grapes and scallions, and season with salt and pepper. Set aside off heat. Grill salmon, skin side up, 5-6 minutes. Turn and grill another 2-3 minutes, or until salmon reaches desired doneness. 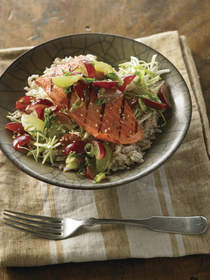 Divide rice among four bowls and top with cabbage and salmon. Spoon grape mixture over top and sprinkle with sesame seeds. Serve with soy sauce, if desired. Nutritional information per serving: 487 calories; 23 g protein; 69 g carbohydrates; 13 g fat (24% calories from fat); 3 g saturated fat (6% calories from saturated fat); 43 mg cholesterol; 301 mg sodium; 6 g fiber. Rinse and drain quinoa. In large saucepan, combine with broth and water. Bring to boil, reduce heat, cover and simmer 10-15 minutes. Drain any remaining liquid. To prepare dressing, combine vinegar, lemon juice, oil, garlic, honey, lemon peel, salt and pepper; mix well. Add 1/2 cup of dressing to quinoa; mix well and cool. Add grapes, pea pods, white beans, celery, cilantro and peppers to quinoa and mix well. Refrigerate until ready to serve. Serve on lettuce leaves. Nutritional information per serving: 219 calories; 8 g protein; 40 g carbohydrates; 4 g fat (18% calories from fat); 0 mg cholesterol; 363 mg sodium; 5 g fiber. In blender, combine milk, egg and salt; add flour and butter. Blend at high speed 1 minute. To make filling, combine grapes, oranges, sugar, liqueur or juice, and orange peel; set aside. Heat lightly-buttered 7-inch skillet or crepe pan over medium-high heat. Pour 3-4 tablespoons batter into pan; tilt to spread batter to cover bottom of pan. Cook over medium-high heat about 1 minute, or until batter is set. Turn crepe and cook about 30 seconds, or until lightly browned. Fill each crepe with 1/2 cup of filling; fold in half or roll up. Top with 1 tablespoon sour cream and sprinkle with cinnamon sugar mixture. Nutritional information per serving: 145 calories; 4 g protein; 26 g carbohydrates; 3 g fat (20% calories from fat); 1.7 g saturated fat (11% calories from saturated fat); 39 mg cholesterol; 80 mg sodium; 1.7 g fiber. Place squash on sheet pan with sides and drizzle with oil, rosemary, salt and pepper. Mix well and roast until squash is browned and soft, about 25-30 minutes, turning after 15 minutes. In large bowl, combine warm squash with pesto; add grapes and cheese and gently toss. Season with salt and pepper, to taste. Divide arugula among four serving plates, top with squash mixture and serve. Nutritional information per serving: 264 calories; 8 g protein; 33 g carbohydrates; 13 g fat (44% calories from fat); 5 g saturated fat (17% calories from saturated fat); 25 mg cholesterol; 223 mg sodium; 5 g fiber. Recent research from the Bascom Palmer Eye Institute at the University of Miami, funded by the California Table Grape Commission, suggests that eating grapes may help contribute to eye health. The laboratory study showed that a grape-enriched diet preserved the retina's structure and function against damaging oxidative stress. Findings from two earlier laboratory studies at different universities also showed that grape consumption helped protect the retina from deterioration.